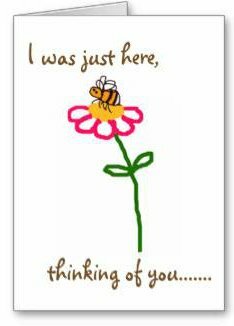 Which Roses Do Bees Like? 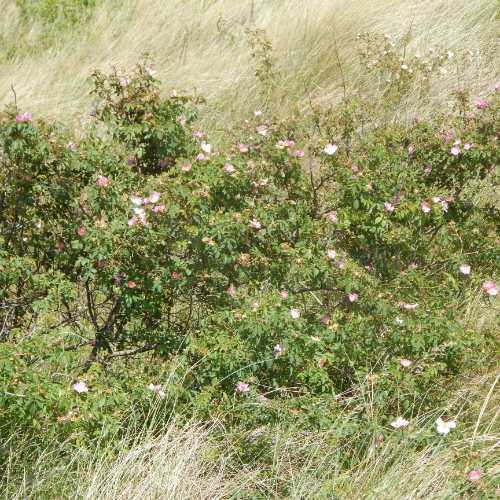 Around the sandy coast where I live, there are many wild rose shrubs growing around the dunes, as well as naturalised Beach Roses (Rosa rugosa). 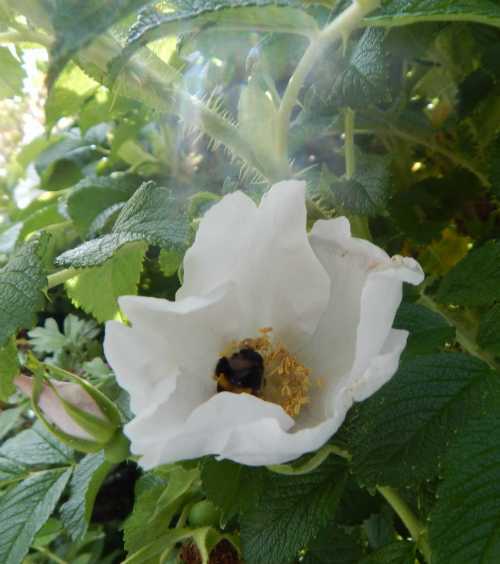 Bees are very active visiting both. 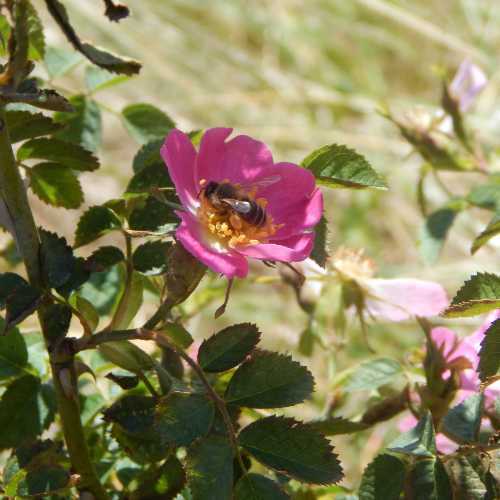 Wild roses and Rosa rugosa have lovely open flowers, and fewer petals than the heavily cultivated varieties. 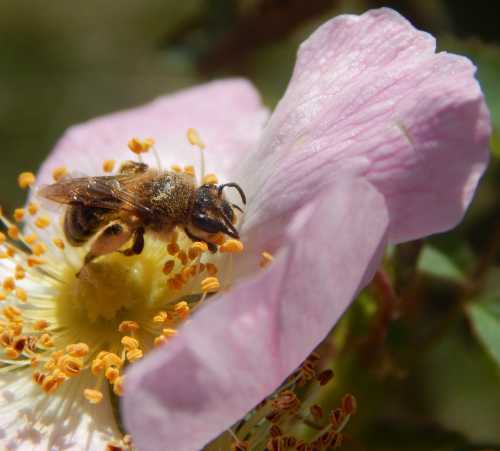 Bees visit especially to collect the pollen. The buzzing of bumblebees can be quite loud as they vibrate their thorax against the anthers to release the pollen. 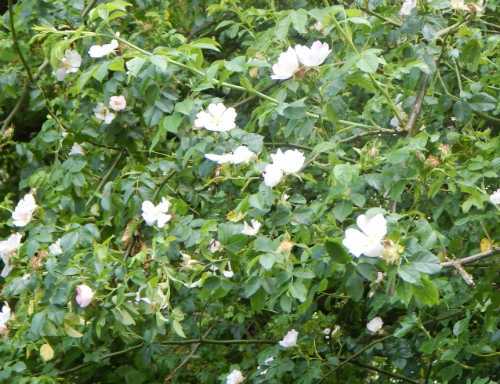 Wild roses can be climbers, or stand alone shrubs. 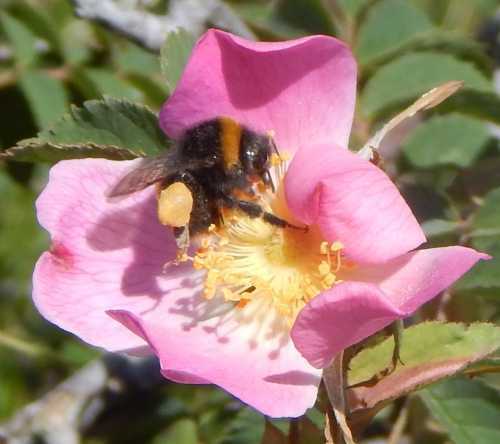 Wild roses are sometimes called ‘dog roses’ but this name actually refers to the climbing wild rose, Rosa canina. 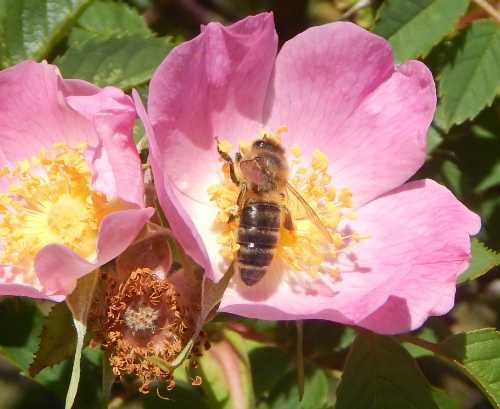 In fact, the term ‘wild rose’ includes and wild member of the genus Rosa (for example Rosa acicularis, Rosa woodsii, Rosa arkansana, Rosa virginiana). 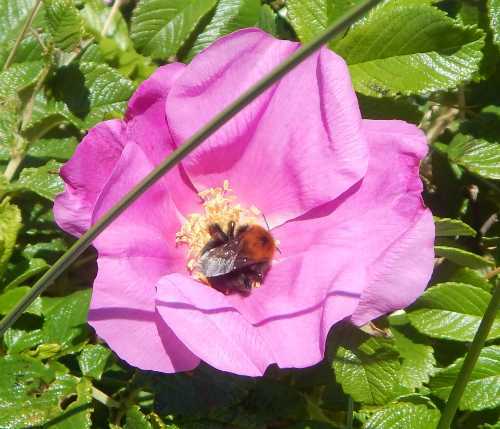 Rosa rugosa can be purchased as a garden shrub, and is is one of my favourite flowering garden shrubs for bees. 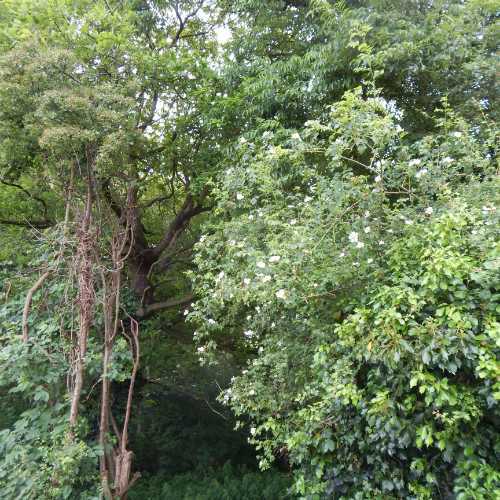 It's a wonderfully decorative bush: it has a fairly long flowering period, the fragrance is absolutely divine, and even the rose hips are wonderfully decorative: like large, red balls which have been slightly squashed! The prickly stems make them an excellent protective boundary shrub too. 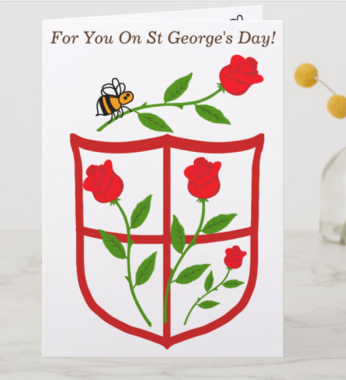 But what about wild roses? 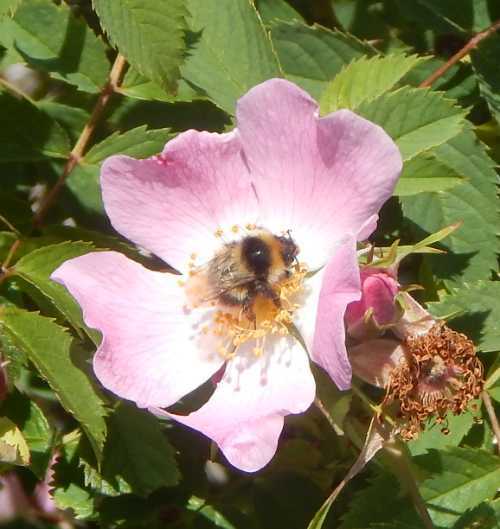 - Perhaps bramble flowers offer a greater food reward for bees than dog roses? 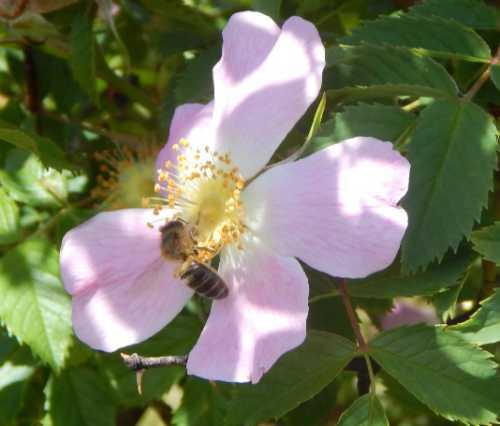 - Perhaps I was not present during the optimum foraging time frame for bees visiting the dog roses?